You've perfected the art of decorating your home. It's on point, trendy and flawless. Then you look outside and think, “I wish I could decorate the outside like I did the inside.” Get ready to do just that, because your guide to the latest indoor/outdoor decorating trends is here! One of the top indoor/outdoor home trends for 2016 is a sunroom addition. It's the perfect complement to your home, as it gives you extra living space and adds value to your home. Sunrooms give you the feel of being outdoors while keeping you comfortable and out of potentially harsh outdoor elements. And the best part is: you can use the latest decorating trends to keep your sunroom looking fashionable and stylish in the future. Painting the exterior of your home gives you the opportunity to show off your personal style, but a new look can also affect your home’s curb appeal, not to mention your neighbors’ view. When choosing a palette, consider elements of your home’s exterior that will stay the same. For instance, if your home has warm colored shingles, tiles, stonework or pathways, try to choose a paint color that will work well with these elements. Also think about your home’s relationship to its surroundings. If your home is covered by bushes or trees, you may choose a lighter palette to make your home stand out. If your home is highly visible or on a corner lot, you may want to choose a darker hue. Most importantly, be sure to test your new shade on your home before you paint. Your home is likely much larger than the average bedroom or living room, so paint chips won’t suffice when deciding on a paint color. Buy a small amount of paint and test it on an area of your home that is not easily seen, to study how the color changes based on weather, placement and time of day. As far as popular colors in sunrooms, porches and patios, pastels are the current color favorites. Make sure the pastels in your sunroom complement the exterior of your house for an amazing style effect. Pair your grey and cream house with pastel green and blue sunroom furniture for a refined decorator’s touch. “Minimal,” “sleek” and “rustic” are the decorating world’s buzzwords for 2016. 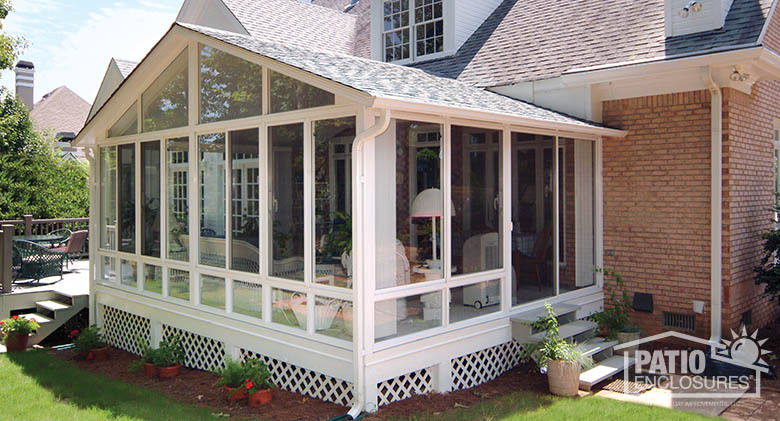 When picking out furniture for your porch enclosure, patio or sunroom, think minimal. Simple outdoor furniture allows you to easily give your patio a modern feel, without sacrificing comfort. While minimalist design is about simplicity, color still plays an important role. Bold colors in the same family can add visual variety to your space. If you get bored with the colors you’ve chosen, add variety with textures like velvet, corduroy or even fur. Be sure to accentuate your patio’s minimal furniture with natural light. Trimming bushes or trees that block light can open up your outdoor space. Adding strings of white lights and large or vintage bulbs can help illuminate the area once the sun goes down. 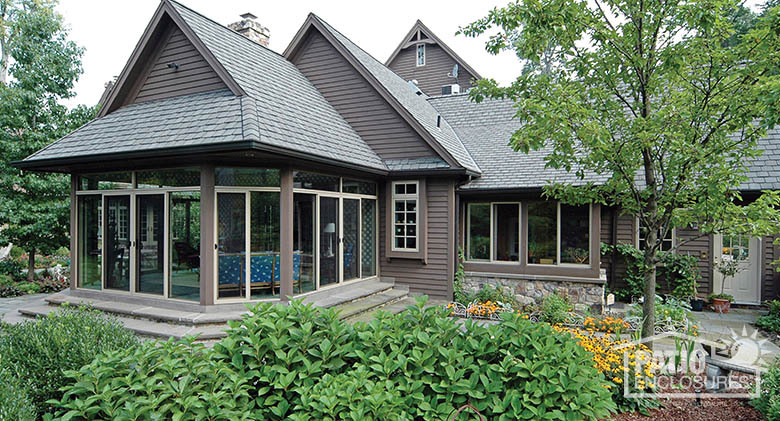 A sunroom addition also helps you with another 2016 outdoor home trend: manageable landscaping. Container gardens that require minimal care have caught on this year thanks to Pinterest posts dedicated to the trend. And there's no better way to control the amount of rainwater and sun your container garden plants get than by growing them in your enclosed porch or patio. Keep in mind that while growing your container garden in your sunroom, you can also cash in on another 2016 landscaping trend: edible gardens. You can grow herbs, vegetables and even fruit in your container garden. Just imagine walking into your sunroom and snipping some cilantro, picking ripe tomatoes and peppers and making fresh, homemade salsa! Also consider drought-tolerant plans for a more sustainable design. Choose plants that are beautiful but also able to withstand dry summers or cold winters. Some options for low-maintenance plants include ground covers, like jasmine, which can prevent weeds. These 2016 exterior color, design and landscaping trends offer a world of new and exciting possibilities for your outdoor living spaces. The only restriction is your imagination! And just like these trends, a custom sunroom from Great Day Improvements also offers endless options! Contact us today to schedule a free, in-home consultation with a Great Day Improvements representative and discover the possibilities.